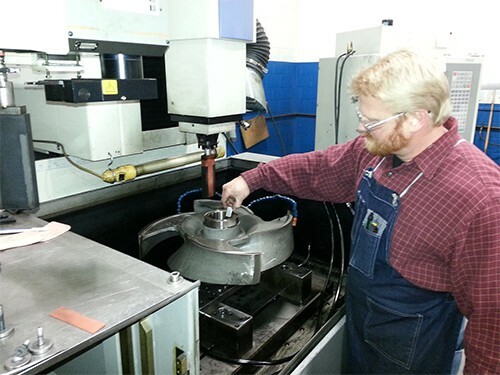 In addition to molds and tooling, our team at Enterprise produces a wide range of precision parts for a variety of industries. The part highlighted here is an impeller that was manufactured for a customer in the new equipment industry. 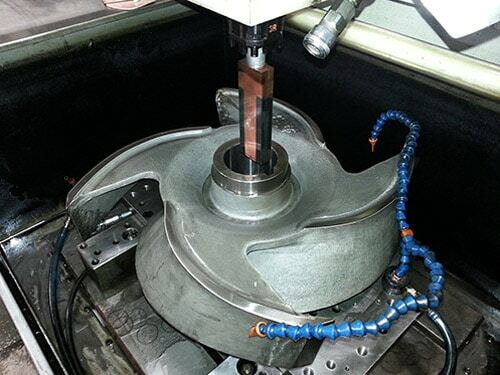 The steel impeller was machined using a sinker EDM center. Electrical discharge machining is ideal for producing single pieces of low-volume parts with a high degree of complexity. 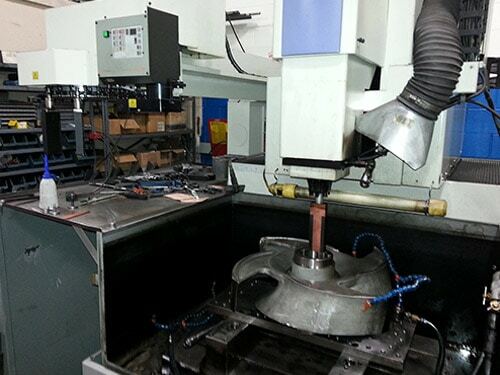 Instead of mechanical abrasion, electrical discharge machining is performed by passing current through two electrodes. This allows us to tightly control the cut and contour during the machining process, and achieve parts with fine surface finishes that meet precision dimensional tolerance requirements. The finished impeller measured 14” in outer diameter and was machined to tolerances of +0.001/-0.000” with a final surface finish of 63 µin. A rust inhibitor was applied to protect the impeller from corrosion and hardness testing was performed to verify conformance to customer specifications. This was a rush order for a vendor that was completed in one day. As a result of our ability to turnaround this part quickly and the quality of our work, the customer has continued to contact us for additional projects. For additional details about this precision electrical discharge machining project, see the table below, or contact us directly.